Children can break their elbows in many different places and ways. Some breaks are more common than others, and some are more serious than others. Some breaks need surgery to move the bones back into place and hold them there, while others can be treated by putting the arm in a cast to keep the bones in place while they heal. Generally, when the broken ends are still in the right place (undisplaced breaks), the injury is less complex and easier to treat than if the bones are out of place and the broken ends no longer face each other (displaced breaks). Displaced breaks can trap the nerves and blood vessels between the bones. This is a medical emergency and needs urgent surgery. The surgery will involve wires – or sometimes plates or screws – to hold the bones in position until they heal. When a broken bone breaks through the skin, this is called an open fracture. Open fractures often also cause damage to the child's muscles, tendons, and ligaments. These take longer to heal. The most common type of broken elbow in children is called a supracondylar (soop-ra-kon-de-lar) fracture. This happens above their elbow in the upper arm bone (humerus). A condylar fracture happens just above the elbow, and usually on the bony outer part of the elbow. These breaks on the bony outer part are called lateral condyle fractures. 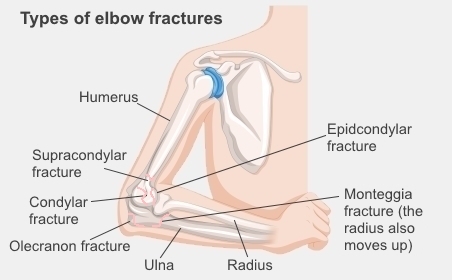 A break that happens at the very end of the bony tip of the elbow is called an epicondylar fracture if it's on the humerus or an olecranon fracture if it's on the tip of the ulna (one of the lower arm bones). Another type of break that happens right on the elbow is called a physeal fracture. Children have areas of cartilage at the ends of their bones – this is where their bones grow. These areas are called growth plates, or physes, so a physeal fracture is a break that happens in a growth plate. Monteggia fractures happen when a child's ulna breaks and the top of the ulna moves out of the elbow joint (dislocates). On the next page: How are broken elbows treated?